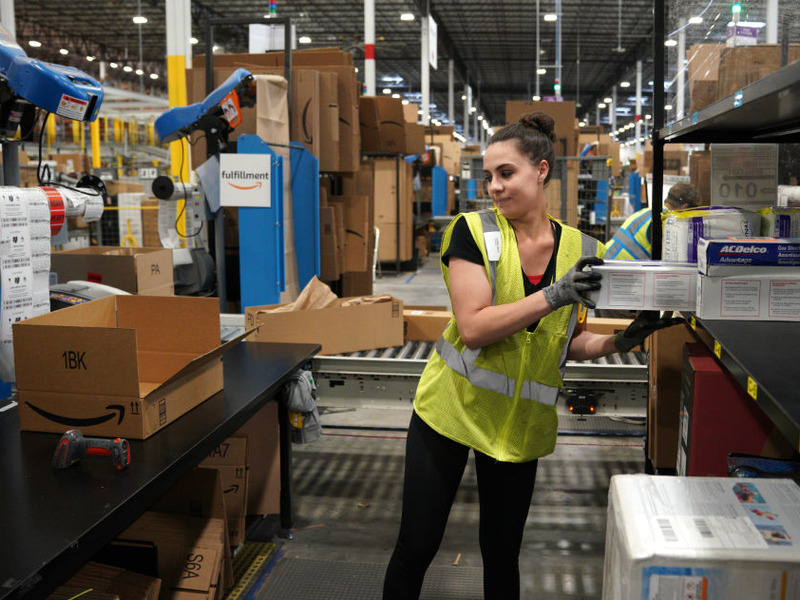 Getty/Rick T. WilkingAmazon says it has employed workers from its fulfillment centres to tweet positively about working conditions. A small army of Amazon employees are tweeting nice things about the working conditions in the company’s warehouses. The Twitter accounts have a standardised format, all bearing the Amazon smile logo as their background. Amazon says these employees are called “FC Ambassadors” who have experience working in the order-fulfillment centres. A small army of accounts have popped up on Twitter to tweet positive things about the working conditions at Amazon’s warehouses. TechCrunch discovered 15 accounts following a standardised format after the Twitter user Flamboyant Shoes Guy drew attention to them. TechCrunch found that all the accounts bore the Amazon smile logo as backgrounds and had identical structures to their bios and the title “FC Ambassador” in their name, followed by a cardboard-box emoji. The accounts engage with people about the working conditions in Amazon’s order-fulfillment centres, weighing in when people tweet negatively about the company. Hello! Amazon does pay their employees minimum wage – any less would be illegal ???? One thing that often gets overlooked are the employee benefits that Amazon provides for all employees – Health insurance, 401K, career/financial counseling. But while Flamboyant Shoes Guy thought these accounts were bots posing as Amazon workers, the company says the ambassadors are real people being paid to spread the firm’s message. “FC ambassadors are employees who have experience working in our fulfillment centres,” an Amazon representative told Business Insider. “The most important thing is that they have been here long enough to honestly share the facts based on personal experience. Amazon has frequently come under fire this year over the working conditions in its fulfillment centres. An undercover journalist in the UK said workers “peed in bottles” over fears that walking to the bathroom would cause them to miss targets. Business Insider’s Shona Ghosh heard one story of a urine smell wafting from a trash can for similar reasons, while constant surveillance and health issues at work were also highlighted.